While the right likes to place blame on the left for being violent, it seems that there are plenty more instances of right-wing violence - most recently, a protester at a Rand Paul rally was either tripped or pushed down by Paul supporters, with one person stomping on the protester's head - all caught on film. Attendees around Valle are heard screaming, "get the cops" as cameras captured her being dragged to the pavement by her red sweater. Once on the ground a man wearing white sneakers pushed the sole of his shoe down on her head. Just another example of right-wing thuggery. 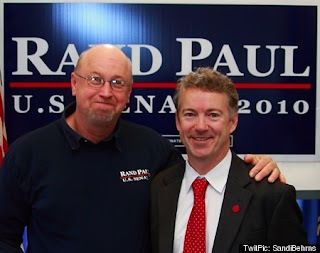 What I found even more interesting were comments from the Paul campaign - of course they stated they desire civility, but the way Paul described the event on Fox News Tuesday, he made it sound as if the protester was guilty of causing the violence. We want everybody to be civil. We want this campaign to be about issues. I will tell you that when we arrived there was enormous passion on both sides. It really was something where you walk into a haze of lights flashing, people yelling and screaming, bumping up. And there was a bit of a crowd control problem. I don't want anybody though to be involved in things that aren't civil. I think this should always be about the issues. And it is an unusual situation to have so many people so passionate on both sides jockeying back and forth. And it wasn't something that I liked or anybody liked about that situation. So I hope in the future it is going to be better. Update - It turns out that the person who stomped on the woman's head was a Rand Paul supporter and volunteer. Rusty the Chickenhawk and Rand Paul tried to claim that the stomper, Tim Profitt, only stomped on her shoulder and not her head. All you have to do is watch the video and you will see this is not true. The Lexington police have now issued a criminal summons to Profitt and the Paul campaign has fired him from his post. The only issue is whether the women in Kentucky will finally wake up to see what Paul will mean to them. And now Tim Profitt is demanding the woman apologize.